If you’re looking for a new dentist in Beaverton, OR you’ve come to the right place! We understand that selecting a general dentist for you and your family is a big decision. We welcome new patients and want to make it as easy as possible for you to get started now with these special incentives. Just click on the + signs at right to read more about each offer. For our patients with no dental insurance, we offer a free exam. Full mouth series of radiographs and comprehensive dental evaluation. (Cannot be combined with any insurance benefits, other discounts, or promotions.) Contact us today for more details. Looking for Beaverton dental appointment now? We are conveniently located within 2 miles of both Intel and Nike campuses in Beaverton, OR. 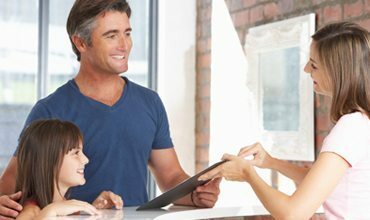 We work with ODS and Delta Dental so you won't have to hassle with insurance claims. We offer extended hours visits by appointment for your convenience. We know you're busy so we'll get you in on short notice, pamper you and get you back to the office in no time. 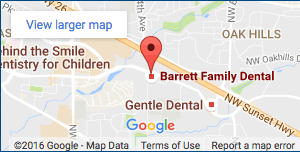 If you need emergency dental care, Dr. Richard Barrett offers the gentle and compassionate dental care you need. If you’ve suffered a dental emergency, we can provide immediate relief from any pain or discomfort you may be experiencing, while also providing long-term solutions for problems. What time of day would you prefer for an appointment? Which day or days would you prefer for an appointment? Dr. Barrett has an excellent chair side manner! Dr Barrett personally called me to check on how my recovery is going! That's above and beyond, and I really liked it. I would definitely recommend this place! I arrived on schedule and was called in without delay. The hygienist was friendly, efficient and painless compared to other outfits. I left the office with good instructions for dental care at home. I would definitely recommend this place. Dr. Barrett is an A+ dentist! Dr. Barrett is an A+ dentist. Great with treatment, but even better at helping prevent cavities!